Anytime Fitness is the number 1, h24 fitness franchise in the world, recently the chain that has more than 3600 clubs around the world has chosen Poltek and Ekinex for the control of the lighting of the two first fitness centers opened in Milan. The KNX-DALI gateways have been used at both the Milano Centrale and Milano Sempione centres to control around 200 LED lighting fixtures. The customer requested the possibility to control the lighting centrally thanks to the Touch&See from which it is possible to adjust the light intensity and control the groups of ignitions. 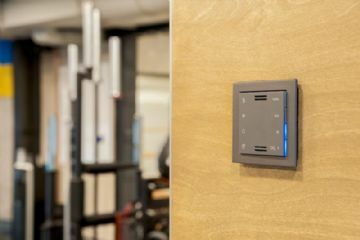 In addition, in some specific areas the possibility of controlling the lighting by means of push buttons was requested, so for example in the yoga and pilates room the course manager can locally adjust the light intensity to create the most suitable atmosphere. The practicality of use was a fundamental requirement as the fitness centers are open 24 / 365 days a year and see therefore different trainers alternate during the day. Thanks to Ekinex products and the simple integration carried out by Poltek, it has been possible to avoid the need to train all personnel punctually, who have been able to manage lighting autonomously since the beginning. Born in 1985, this industrial expert owes his technical training a certain methodical framework in dealing with new projects. As soon as he graduates he starts working in the electrical sector, soon to be noted for the predisposition to deal with everything that is technology: alarms, data network, PCs, audio systems. Some short experiences in Europe and the Middle East complete his career, enriching his professionalism. Convinced that only the combination of technique and passion guarantee excellent results, he is co-founder and Project Manager of Poltek.